We just came back from an amazing weekend road trip to Palo Duro Canyon State Park located in the Texas Panhandle! Known as the Grand Canyon of Texas…this park wowed us in every way from the gorgeous landscape to the challenging hikes to the vintage cabin we stayed in with a view that kept us feeling at peace the entire weekend! So before we share more of our trip in future posts, we wanted to share our 10 reasons why you should visit Palo Duro Canyon…our new favorite Texas state park! It’s known as the Grand Canyon of Texas. Palo Duro Canyon is the second largest canyon in the U.S being 120 miles long, 20 miles wide, and up to 800 feet deep. Although it is not as massive as the Grand Canyon National Park in Arizona, Palo Duro Canyon is dramatic to say the very least with its steep mesa walls and amazing multicolored rock formations. It’s definitely Texas’ version of a natural wonder! The hiking is scenic at its finest. It is never boring hiking Palo Duro Canyon with its gorgeous landscape that look like a painted work of art. In fact, on some parts of the trails, it feels like you are walking on another planet with odd shaped rock formations protruding from the land while you maneuver through red sand dusting your hiking boots! 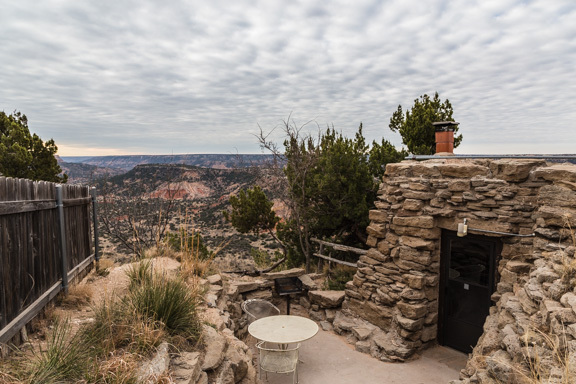 You can stay in a vintage cabin with panoramic views of the canyon. Set atop the canyon rim sits three vintage cabins. 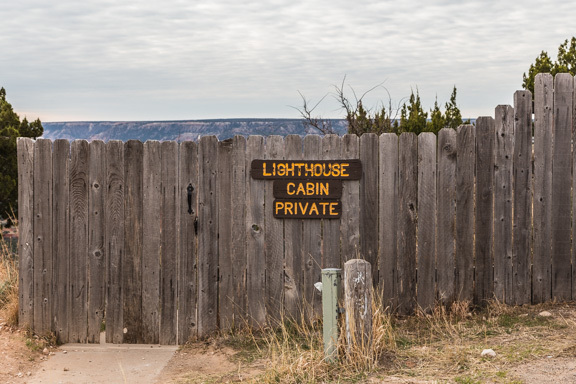 Historic and charming, these cabins provide the most stunning views of the canyon making sunsets, sunrises, and pretty much any time of the day or night a nature show you’ll never want to end! Horseback riding is welcome. There are 1500 acres set out for exploring this awe-inspiring park by horseback. So whether you want to bring your own horse or rent one for a guided tour through Old West Stables…no doubt, you’ll be feeling like an explorer from a time before! They have cool wildlife like roadrunners. Although you won’t see bears or rarely mountain lions which might be a good thing if you fear large animal attacks, Palo Duro Canyon’s wildlife is quite diverse with animals like the Texas horned lizards, Palo Duro mice, wild turkeys, white tailed and mule deer, coyotes, bobcats, and many birds like our personal favorite…roadrunners. If you’ve ever seen a roadrunner run…it is the cutest thing! The park has a rich history. 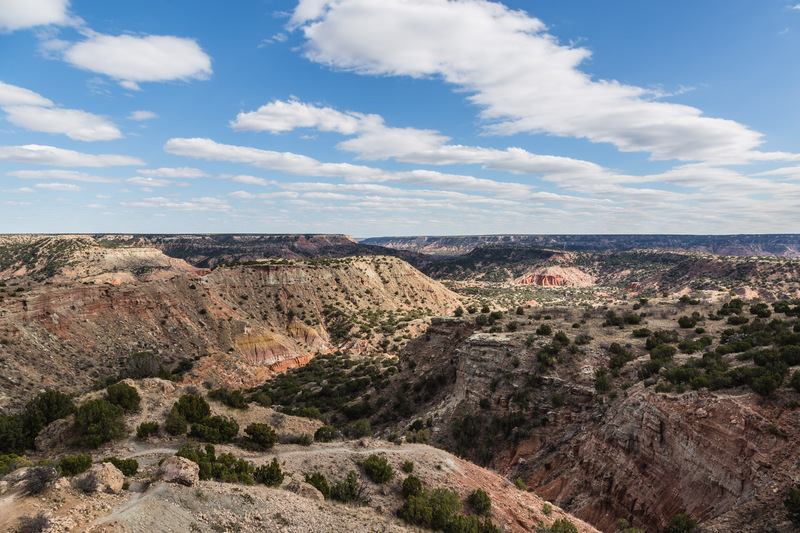 It’s hard to imagine, but Palo Duro Canyon has been inhabited for about 12,000 years with the first being the Clovis and Folsom people who used to hunt large herds of mammoth and giant bison. Others like the Apache, Comanche, and Kiowa people lived there as well. In fact, there was a famous battle there between the U.S. Army and the Southern Plain Native Americans. In addition, starting in the 1880’s, the park was privately owned and was primarily used as a ranch. Can you imagine owning this whole canyon? Nevertheless, in the 1930’s, the park was finally bought by the state and converted into a park by the help of the Civilian Conservation Corps workers. Many remnants of this history can still be observed today with historical bridges, buildings, and even a Cowboy Dugout built into the hill where ranch cowboys used to stay! The winding road leading to the canyon floor is a driver’s paradise. One of the great things to do at Palo Duro Canyon is take the road down from the canyon rim to the floor. If you love driving down winding roads that twist and turn and test gravity, then you’ll love this road! The Trading Post has awesome burgers. When you are tired from a long day of hiking or horseback riding, sometimes all you want to do is eat…eat a lot which is why the Palo Duro Canyon Trading Post is a great spot to do just that. Not necessarily the most healthiest of options, but we highly recommend their “world famous burgers” and fries…super tasty! You can watch the “Texas” musical at their outdoor amphitheater…barbecue included. Located on the floor of the canyon, lies an outdoor amphitheater carved out of and nestled in a natural basin that houses an entertaining musical called Texas during the summer months. What is also included during this fun filled history lesson with a gorgeous view, is a chuckwagon style dinner aka barbecue if you purchase a dinner show! It’s not far from a major city aka Amarillo. 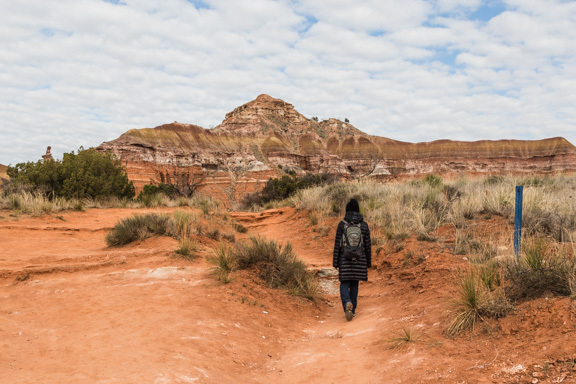 Palo Duro Canyon is surprisingly about 30 minutes from Amarillo, the largest city in the Texas Panhandle which means that even amongst nature, you still have access to city life nearby if you forgot something on your packing list or if you need to desperately make a Starbucks run! Which of these 10 reasons motivates you to visit Palo Duro Canyon State Park? Leave a comment…we would love to hear what you think!